A new survey found that one-in-ten drivers text or talk on their phone. AS MANY AS one-in-ten motorists are still using their mobile phone while driving, according to a new survey. This is despite a ‘legal grey area’ being removed earlier this year which means texting while driving is now illegal. The number of penalty points for the offence of using a mobile phone while driving rose from two to three on Friday. A survey by easytrip analysed the habits of 1,000 motorists, and found that more than half texted or checked their phone, while 48% spoke on their phone. “Three months on from the introduction of the new penalties for texting, and it seems that a lot of motorists are still ignoring the dangers,” general manager of easytrip Ciara O’Brien said. Younger drivers and women were more likely to text or check their phone, while talking on the phone was the illegal habit of choice for those aged between 40 and 50 and men. More men than women were found to be using their phone while driving. Since 1 May this year texting while driving has been illegal, as previous legislation was not clear on the issue. However, it is still legal to use sat-nav software, and arguably to use a cup while driving, as long as it is done safely. 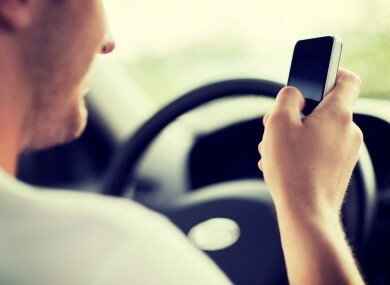 Email “New laws haven't deterred one-in-ten motorists from using their phone while driving”. Feedback on “New laws haven't deterred one-in-ten motorists from using their phone while driving”.